Because higher fuel economy translates to lower CO2 emissions, steady progress on fuel economy is crucial for reducing transportation's contribution to global warming. Although concern about global warming is growing, consumers don't necessarily think about it when car shopping. Traditionally, fuel economy was a pocketbook issue. With gasoline being a non-trivial expense for most households, it's only natural that interest in efficiency waxes and wanes as pump prices rise and fall. A generation ago, the need to economize on fuel became front and center during the energy crisis, which saw gas lines, "even-odd" rationing and a recession that high energy costs helped trigger. In 1986, the price of oil tumbled and it remained low for nearly another 15 years. For the vast majority of consumers, fuel economy no longer mattered. 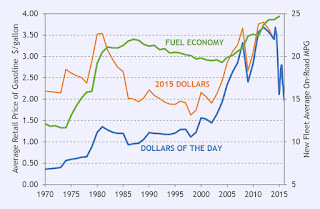 Fleet average miles-per-gallon peaked in 1988 and then began a slow slide through the "what me, worry?" 1990s, which saw the rise of the SUV and renewed horsepower wars. But by the turn of the millennium, commodity markets were tightening as Asian economies recovered and began growing -- and consuming energy -- more rapidly. Then came 9/11/2001, which again brought home the peril of the Middle East's grip on oil. By the time the United States conquered Iraq, petroleum prices were climbing steadily, fear of peak oil reared its head and fuel economy came to matter to consumers once again. But today, after the inevitable lag, oil production has once more overtaken the dampened energy demand. Fuel prices no longer signal a need for higher efficiency and consumers are finding gasoline to be more affordable than it was over a year ago. Nevertheless, CO2 emissions and the risk of future price spikes means that fuel economy should still matter even if consumers are no longer so pinched at the pump. 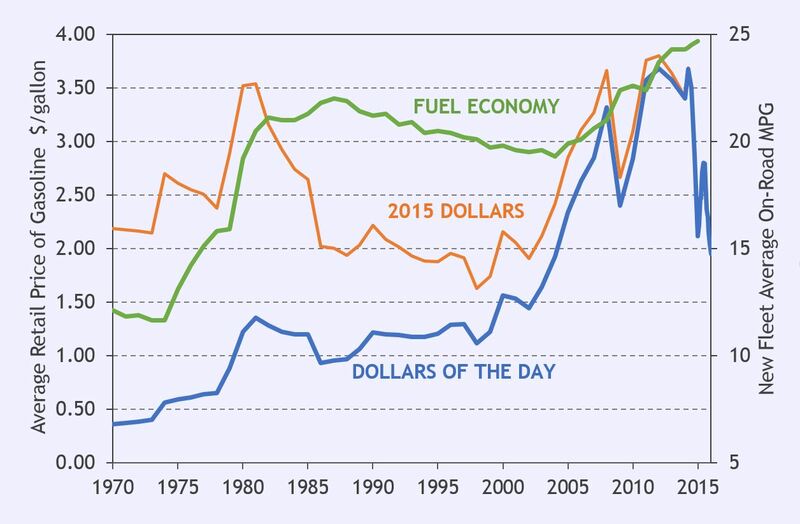 So a question we face today is this: are there ways to bolster consumer interest in fuel economy for environmental reasons, even when fuel prices are low?